by Dixon, Jeffrey C.; Singleton, Royce A.; Straits, Bruce C.
Jeffrey C. Dixon is Associate Professor of Sociology at the College of the Holy Cross. Royce A. Singleton, Jr., is Professor Emeritus of Sociology at the College of the Holy Cross. Chapter 1. Introduction: Why Care About Research Methods? 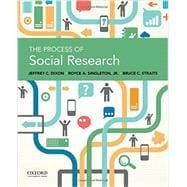 -- Reading Social Research 2.1: Verify This! Chapter 3. The Ethics and Politics of Research: Doing What's "Right"
Chapter 7. Experiments: What Causes What?